Good Morning! My SIL asked me to make a special card for her to give to a very special person, and this is what I came up with. I hope they both like it! I started out intending to use Karen's Sweet Sunday Sketch #35, but as I was making the card, I decided to leave out 2 panels and keep the layout a little simpler. I also didn't want to cover up the gorgeous patterned paper! It's one of my favorites from the Basic Grey Indian Summer line. Thanks so much for stopping by! I'll be back tomorrow for TSC Wednesday! 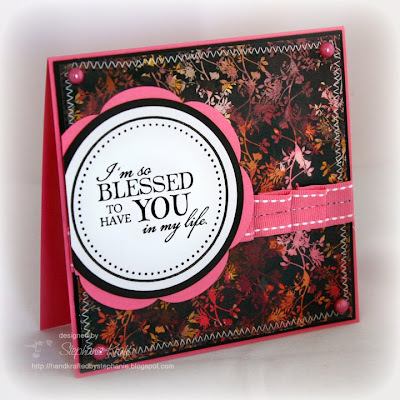 Card is 4.5" x 4.5"
Accessories: Circle and Blossom Nestabilities (Spellbinders), Ribbon (Papertrey Ink), Pearls (Kaisercraft), Thread, Sewing machine. gorgeous!! love the background paper and the fab flower!! This is so pretty. I'm loving that paper! Gorgeous card! I have that Nestability set and never thought of using it that way, but it looks fabulous. I found the Indian Summer paper today, too....yummy!